When you think about Thanksgiving Day, does an image come to mind as your mental picture of Thanksgiving? Does that image take place in a dining room? Is it a dining room you currently own or rent, or one owned or rented by someone you know? Or does Thanksgiving remind you more of outdoor activity or a living room full of football fans? Is your childhood Thanksgiving like your current one? Whether a dining room is “necessary” is part of the initial discussion that I have with my clients before we hit the road. This is not a solely urban-suburban question. There are city dwellers who demand a dining room and suburban ones who plan to use theirs as a playroom. From what I see, it has to do with whether the prospective homeowner plans to entertain via dinner parties or whether guests will spend their time in the living room, family room, or yard. Some people see a house without a formal dining room as one to instantly rule out. They intend to have dinner in a dining room nightly. They want to be “the house” where Thanksgiving is held for the whole family. Others want an eat-in kitchen. Once there is a kitchen table, the dining room gets light use. Many people then decide that having two tables are a waste of space. The dining room changes into a second sitting room, suitable for a home office. These same people complain that the dining room table becomes the paper piling site. With the family-gathering season upon us, is the presence of your dining room more important to you? 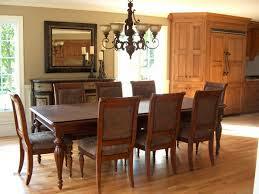 Did the presence of a dining room make the top five important features of the place you live in now? Did your need for a dining room change at different times of your life? Happy Thanksgiving to you all. I hope you all enjoyed Thanksgiving in good health.